Dr Dusingizemungu said Sweden is walking the talk. The New Times/ File. A court in Sweden yesterday sentenced Stanislas Mbanenande to life in prison over his role in the 1994 Genocide against the Tutsi. The Stockholm District Court convicted Mbanenande of Genocide, saying he was involved in the killing of thousands of people in the then Kibuye Prefecture, now Karongi District, between April and June 1994. The court said Mbanenande had an informal role as leader among Interahamwe militias in Kibuye and was involved in organising several massacres. Among the massacres included those in Nyamishaba school, a Catholic church, Hotel Home St. Jean, in Besesero and at Gatwaro Stadium. Mbanenande, a former teacher, was also convicted of personally shooting at people with an automatic rifle that he carried during the Genocide. Mbanenande played a key role in the genocide and that other Western countries should emulate the Swedes and convict genocide perpetrators. “This conviction is a result of the hard work between the Rwandan prosecution and the Swedish authorities and it’s a conviction that is truly deserving,” said Alain Mukuralinda, the prosecution spokesperson. The president of the umbrella association of genocide survivors (Ibuka), Dr Jean Pierre Dusingizemungu, said Sweden has joined countries that are setting the precedence of what the West should be doing to bring perpetrators of the 1994 Genocide to book. “Justice has been served in Sweden. We welcome that but we still have concerns of countries that don’t have laws punishing Genocide perpetrators and they end up charging these criminal with other provisions,” he said. Mbanenande, 54, is a naturalised Swedish citizen. He was convicted of playing a key role and participating in murder and kidnapping. “We had a variety of information from both victims, accomplices of crimes and independent witnesses. For the survivors, it comes to observations made in extremely difficult circumstances, that, in the opinion of experts, which helps them to remember the appearance of the offender,” Judge Tumas Sander is quoted as having said while delivering the verdict. “This man was extremely known in the city, and it also facilitated the process of identification. 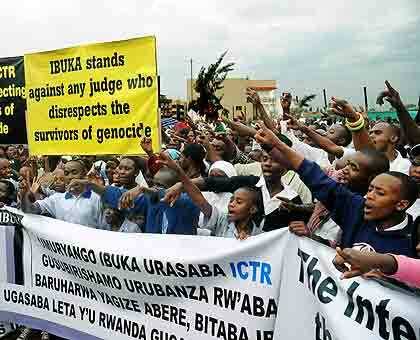 It has been proved that the purpose of the acts of which the defendant has now been convicted was to wholly or partly destroy the Tutsi ethnic group. The acts have, therefore, been assessed a genocide,” Sander pronounced, before handing out life in prison, the heaviest sentence under the Swedish laws. Mbanenande has been in Sweden since 2007, when he joined his family and obtained a residence permit based on family reunification grounds. He obtained Swedish citizenship a year later. After the Genocide, he worked with several international agencies, including the United Nations. Following his arrest in 2011, Rwanda asked Sweden to extradite him to face charges, but Stockholm refused because he had acquired Swedish citizenship. Sweden becomes the second Scandinavian country to convict a Rwandan Genocide suspect, following the conviction last year of Sadi Bugingo by a Norwegian court, which handed him 21 years in prison, the highest prison sentences that can be prescribed in their laws. Other countries that have moved to arrest and try Genocide suspects include Canada, which in 2009 convicted Desire Munyaneza to life for his role in the Genocide in the former Butare Prefecture. A Dutch court also tried and sentenced Joseph Mpambara in 2011. Right to reparation for victims : Signals for hope?